It is that time of year again… we’ve made it through another sports dry spell and now are weeks away from the start of another College Football season. There are several intriguing match-ups to open the regular season but none more than the Cardinals and Boilermakers. There is not much history between these teams and the only time they played back in 1987 the game ended in a 22-22 tie. But there is a lot of history between the Louisville Program and men who will be leading their teams into battle on September 2nd in Indianapolis. To say that Louisville’s opener against Purdue hits home would be a massive understatement. If your last name is Brohm you are born a football fan. They are arguably the first family of football in this hoops crazy state of Kentucky and in the city of Louisville they are football royalty. The Brohm family, including mother, Donna, and sister, Kim, were recently inducted into the Louisville Catholic Sports Hall of Fame for their contributions to the game. It all started with the patriarch of the Brohm family Oscar. Oscar Brohm was a Football standout at Flaget High School in Louisville during the 1962-65 seasons. An all-state performer he led Flaget to a 10-1 record and the Louisville City Championship in 1965 setting a Louisville city school record with 23 touchdowns. He was a passing QB when passing wasn’t cool. Oscar played QB for the Cardinals during the 1968 and 69 seasons. He would pass his offensive prowess down to his sons and they all helped create a football dynasty at Trinity High School in Louisville and for the hometown Cardinals. There have been four Brohm family members to be a football letterwinner at the University of Louisville, Oscar (quarterback 1966-69), Jeff (quarterback 1989-93) and brothers, Greg (wide receiver 1989-92) and Brian (quarterback 2004-07). Greg Brohm is in his first season as executive director of administration and operations at Purdue. He was the starting wide receiver during the Cardinals’ 1991 appearance in the Fiesta Bowl, catching passes from his brother, Jeff. Greg served as the director of football operations at Louisville from 2004 to 2008. He also worked in local media and served as an analyst for the Louisville Cardinals’ radio broadcasts. Brian Brohm is the Co-Offensive Coordinator/Quarterbacks coach for Purdue… Before there was a Teddy and Lamar it was Brian who led the 2006-7 Cardinals to a 12-1 record, Orange Bowl championship, and a #5 final ranking in the Associated Press poll. His 30 touchdown passes that season are tied for second in school history with 2016 Heisman Trophy winner Lamar Jackson, and one behind Minnesota Vikings’ 2014 first-round draft pick Teddy Bridgewater. Brian is the only Louisville QB to be so close to a National Championship. In my humble opinion that team was a field goal away from playing for the Title. What could have been that season still haunts me. 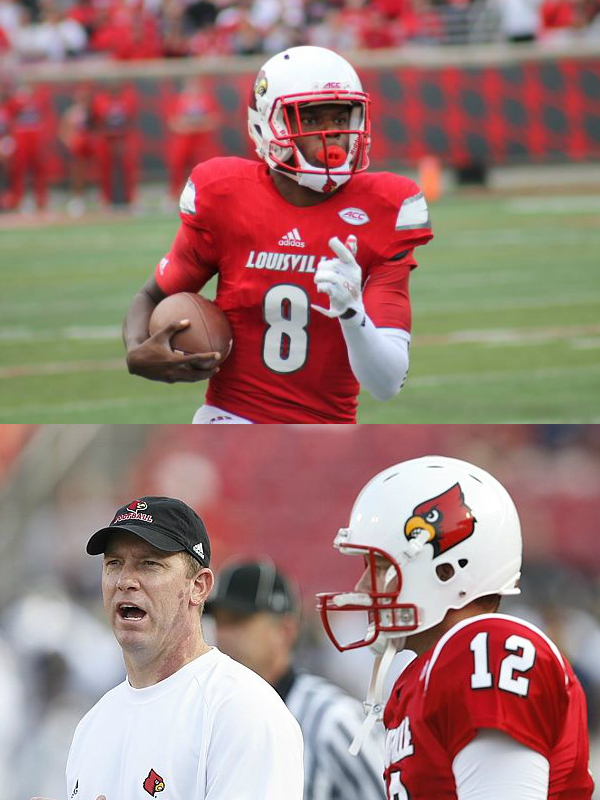 During their three seasons together Jeff, Greg, Brian and Coach Petrino led the Louisville program to 32 wins, Liberty Bowl win, Orange Bowl Championship, Conference USA and Big East championship and twice finished in the Associated Press top 10. And by popular opinion were a field goal away from a possible National Championship. There isn’t anyone who has had a bigger impact on the rise of the Louisville football program than the Brohms and now they will be on the opposite sideline as the Cardinals open up the 2017-18 College Football season. In his book The American Civil War, John Keegan wrote that “The American Civil War was to prove one of the most ferocious wars ever fought”. Not only for its nature but in the way it was fought. It was family battling family right in their own backyards. On September 2nd College Football is having its own version of a Civil War. Right in Louisville’s backyard in Indianapolis and it will be family versus family. I will be among the Louisville fans who will be torn on that day. The Brohm Brothers were Louisville First and they will be Cardinals Forever. If there is a more intriguing match-up on the first full weekend of the College Football season I don’t see it. 36 Days Away…. Go Cards!